Supporting the success of artists and all Bullseye users is central to our mission. Whether you're an absolute beginner or a seasoned kiln-glass professional, you'll find a wealth of opportunities in the following resources. The Bullseye Projects artist-in-residency program offers artists the opportunity to develop their work in kilnformed glass. Our well-equipped studios in California, New Mexico, New York, and Oregon provide artists with opportunities to explore new avenues of research and the freedom to experiment using a wide variety of techniques. Past participants include: Narcissus Quagliata, Jun Kaneko, Rudi Gritsch, Richard Whiteley, Judy Tuwaletstiwa, Jessica Jackson Hutchins, and Anna Mlasowsky. Hosted at Bullseye Projects, this biennial exhibition acknowledges the work of students and early-career artists working in kiln-glass. All who are not represented by top galleries are encouraged to apply to the Emerge competition. 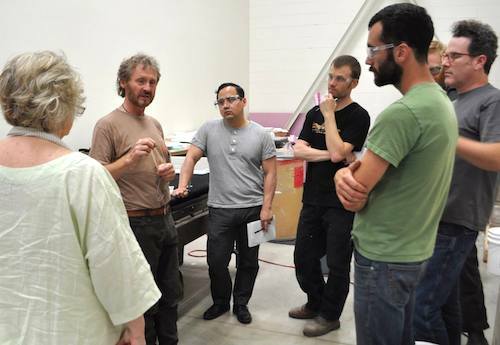 Our teaching studios in the Bay Area, Los Angeles, New York, Portland, and Santa Fe offer short-term courses year round for students at all levels, from glass fusing beginners to advanced kilnformers. These workshops encourage fine design and craftsmanship in kilnforming, kilncasting and torchworking. Bullseye staff instructors and respected guest artists meet with students in a friendly, supportive atmosphere, in state-of-the-art facilities. New classes are posted throughout the year in the. Bullseye Videos, our online video lesson subscription program offers first-rate instruction in the art and craft of glass fusing. Lessons (designed by the artist/instructors in Bullseye's Research & Education department) provide foundational skills as well as inspiration and leading-edge approaches for more advanced kilnformers. Subscribers enjoy access to our complete library of more than 80 lessons, and new lessons are added regularly throughout year. Many glass art practitioners resolve their questions with our ever-expanding library of free technical articles, while About Our Glass provides information about the working properties of individual glass styles. Bullseye Forum is a great way to tap into the advice of Bullseye technicians and experienced artists and craftspeople working in their own studios. Access to the Forum is free (if you subscribe to our videos lessons, you're already registered).